Russian Foreign Minister Sergei Lavrov's visit to Brussels showed that Moscow is looking for platforms for constructive interaction with Europe. Though a wide range of issues were discussed - from illegal immigration to the fight on terrorism - special attention was paid to finding ways to resolve or control the crisis in Ukraine. During his visit to Brussels May 18-19 Lavrov spoke at a session of the committee of foreign ministers of the Council of Europe, met with Council of Europe Secretary General Thorbjorn Jagland and with the High Representative of the EU for Foreign Affairs Federica Mogherini, and talked with NATO Secretary General Jens Stoltenberg. Lavrov later said that relations between Russia and the European Union remained "dismal due to Brussels' blockage of almost all the channels and mechanisms of interactivity." At the same time he remarked that there is "certain progress," including that in talks related to the free trade zone between the EU and Ukraine that are held with Russia's participation. During the session of foreign ministers in which he took part, Lavrov also praised the work of the Council of Europe. Speaking during the foreign ministers' session, he again insisted that Moscow is committed to creating a common space for economic, security and humanitarian work "from the Atlantic to the Pacific Ocean." Lavrov said that the cause of the current crisis in Ukraine reflected the lack of such a vision and the formation in Europe of new dividing lines between western countries and Russia. In order to regulate the Ukrainian conflict he added that it is necessary for Kiev to engage in a direct dialogue with the militias, as well as hold constitutional reforms. Russian observers believe that the regulation of the crisis in Ukraine was the principal theme of Lavrov's visit. They also link it to recent trips to Russia by U.S. Secretary of State John Kerry and his deputy Victoria Nuland. Those visits suggest a change in Washington's approach to events in Ukraine, they say. Maxim Bratevsky, an expert at the Center of European Studies at Moscow's Higher School of Economics, says that "after a year of hostile declarations" dialogue has begun between Russia and the West. Bratevsky divides Lavrov's Brussel's agenda into tactical and strategic objectives. Moscow's aim to convince the Europeans to participate more actively in the realization of the Minsk Agreements by exerting more pressure on Kiev and helping Kiev implement its constitutional reforms, is tactical, he says. Lavrov's strategic objective focuses on restoring relations between Russia and the EU and the cancelation of sanctions. 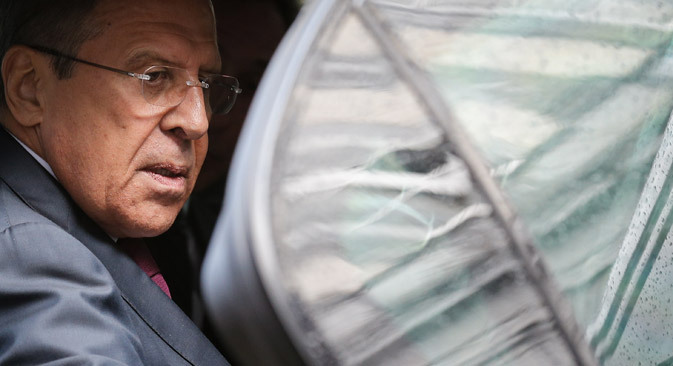 Little definite information has emerged on the results of Lavrov's talks in Brussels. Speaking about his meeting with the Secretary General of the Council of Europe, Lavrov mainly talked about the role of the organization in the regulation of the Ukrainian crisis. Concerning his meeting with Federica Mogherini, the Russian Foreign Ministry published a short announcement. After the talks with Stoltenberg, the NATO Secretary General once again repeated his assertion that Moscow is actively backing the rebels and called for an end to that. Moscow denies that it is aiding or supplying pro-autonomy militants in Ukraine. The scarcity of official information on Lavrov's meetings may reflect the complexity of negotiations that, according to observers, is related to the fact that Russia and the EU have completely different views on how to solve the Ukrainian crisis. Pro-Kremlin political analyst Sergei Markov says that Lavrov's aim was to build bridges and bring the positions of both sides closer together. There is now likely to be a period of "intensive diplomacy," Markov says, tied to the change in the U.S. position towards the crisis in Ukraine. Washington is no longer betting on a military solution to the conflict in Donbas and "for the first time has seriously started speaking about the realization of the Minsk Agreements," the essence of which is to try to find a political solution to the conflict. Washington's change of position is a challenge for everyone involved in the conflict in one way or another, a challenge to agree on approaches to elections in the separatist regions, which is the central issue in achieving a political solution to the crisis. Finding a way through that conundrum was Lavrov's key aim in Brussels, Markov says.